Take a bite out of expenses with DETECTOs RP30 digital ingredient scales. A cake produced in a retail bakery can have up to eight ounces of excess icing applied. The Detecto RP30 series allows you to view the exact amount of icing as it’s applied, reducing ingredient inventory costs based on weight. With a busy bakery completing several cakes per hour, product savings adds up fast. The rotating platform further reduces production time, creating big savings and a fast payback on your investment. 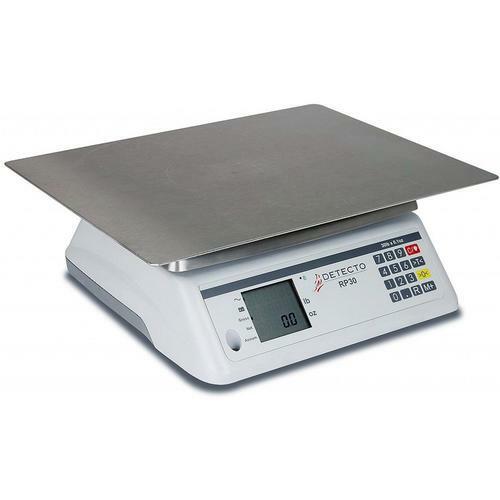 Pizza Kitchens - Detectos RP30 series scales are great for pizza preparation. The cost cutting advantages of monitoring ingredients become clear when you start considering the numbers. Eliminate excess usage of high-cost ingredients like deli meats, olives, and cheese, and this scale typically pays for itself in 3-6 months. Sandwich Shops - This scale is a must for any sandwich shop. Monitor the weight of sandwiches as they are being prepared, making it an excellent training tool to teach young apprentices the importance of consistently making a great product without giving away valuable commodities. Equal and consistent proportions every time! Retail Bakeries - Its not uncommon for frosted cake to carry between 6 and 8 ounces of excess frosting. Frosting costs around 75 cents per pound, so at 25 cakes per day, 6 days per week, 52 weeks per years, thats over $2,500 a year in wasted overages in ingredients. Detectos RP30 series helps prevent this with consistent portioning. PUSHBUTTON TARE Speeds Weighing Operations -Detectos RP30 series allows you to view the weight of icing or ingredients while they are being prepared directly on the scale. Pressing the TARE key allows you to view the weight of each individual ingredient as it’s added to the product. Once the product is prepared, simply remove it from the scale and view the total weight of all ingredients.